South West MLC Adele Farina has become an honorary ‘Drone Command Mambo Pilot’ after taking part in a demonstration of SWCC’s school incursion program last Friday. Ms Farina flew a mini Mambo drone inside a controlled space and learned more about the technology and its various applications in Science, Technology, Engineering and Mathematics (STEM) education and natural resource management. Prior to the demonstration at the SWCC Bunbury office, chief executive officer Steve Ewings, chair Bill Biggs and senior management met with Ms Farina to discuss SWCC’s current projects and other environmental conservation and Landcare priorities across the region. Mr Ewings said SWCC would continue engaging with Ms Farina and other members of the WA Parliament to ensure environmental health remained a focus for government investment. 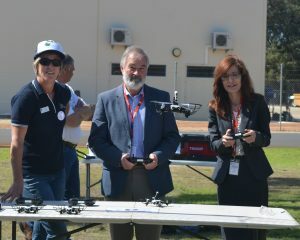 SWCC project manager Derani Sullivan trains SWCC chair Bill Biggs and South West MLC Adele Farina in drone flying.